Harare, Zimbabwe. William Addison, an American embassy employee, is missing – allegedly he and his local girlfriend attended a religious ceremony after which he simply disappeared in front of hundreds of onlookers in a whiff of smoke. As he was a close friend and a golf buddy of the ambassador himself and the local police, understaffed and underpaid, can’t and/or don’t want to cope with such a mysterious case, Dominic Grey, a Diplomatic Security special agent, is ordered to investigate. Adding the investigation is a Czech religious phenomenology professor, Viktor Radek, and the local government liaison, Nya Mashumba. Soon enough Grey uncovers crimes which can be traced back to a terrifying ancient cult and quite contemporary local mobsters, both of them ruthless, deadly and hell-bent to achieve their goals and kill him in the process. Will his violent, abusive childhood, martial art training and diplomatic connections allow him to get to the truth in time? Will he be able to protect the others? One of the huge assets of this book was the fact that Zimbabwe felt very real, with its problems, poverty, crime, inflation, fauna and flora, culture etc. Somehow you can always tell whether or not the author has personally visited and explored the country he/she is writing about, even if you haven’t been to the country in question yourself. Here the answer to that question was definitely a yes. I might not have a chance to visit Zimbabwe so I was even more eager to dwell on every tidbit about the local culture and atmosphere. It was an interesting journey and it made this book more original than the usual fare. The premise was interesting as well – few authors bother with religion-based crime and cults because, let’s face it, religion is a sensitive topic. Even if you don’t mean any harm some people will be outraged/offended anyway. Mr. Green put an appropriate disclaimer at the end of the story just in case – a proof that he knows how delicate a topic can it be. Still he managed to balance things nicely, at least in my very humble opinion, bringing up interesting issues of the power of faith and boundaries of our mind. Well done! The research on Yoruba religions and Juju was impressive, detail-rich and absolutely persuading, exceeding the usual standards of such novels. I enjoyed it as African folklore is not exactly a well-known topic, definitely not as popular as European mythologies. The pace of the narration was as fast as I like, with several twists and turns; the mystery – not so easy to solve. I swallowed this one in two evenings and I liked the way it was written. If only the psychological portraits of main characters were more profound I would be very pleased indeed. Unfortunately they weren’t, despite the offered background. The book is clearly plot-driven, not character-driven and it’s a pity. Let’s say just this: most of the characters had potential which was left unexplored. Dominic was a bit too stiff to be totally likeable, not to mention his paramour, Miss Mashumba, who seemed to be a classic case of an introverted little clam. I know, I know, she has been mourning her late father; still her pain was not so terribly acute to prevent a little romance…and do not let me start on baddies who remained cardboard-flat and ugly, every single one of them…on the other hand I do hope not all is lost yet, there is at least one more book available; perhaps I will be able to warm to Dominic Gray, his beautiful Nya and even the mysterious, and a bit stodgy Victor. 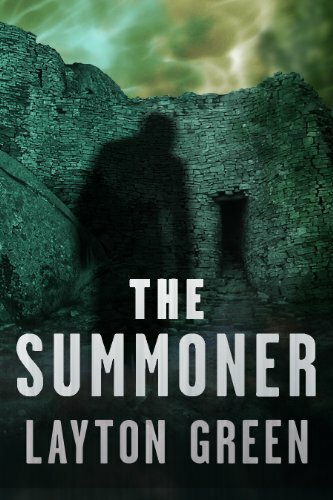 For the second time I was surprised that such a good book didn’t find a publisher – the Summoner is certainly better and more original than the average fare I have had the opportunity to get acquainted with. I will gladly continue reading this series. If you’re in the mood for an intriguing thriller, give it a try! For those who are squeamish about torture scenes: there are some parts of this book that might make you uncomfortable to say the least of it. They are not very bad, not nearly the worst I’ve read, but bad enough. Here, you have been forewarned. This entry was posted in book review, crime, mini review and tagged Layton Green. Bookmark the permalink. Jen, no children tortured here and no, I don't think you've been desensitized. Everybody has their own area of squeamishness I suppose.Melissa just give it a try!Blodeuedd – it just proves that publishing success only partially depends on the quality of your writing. You must be also a bit lucky I suppose. Most of my 'finds' come from wandering aimlessly through bookstores and going through the discount bins. How do you find a book like this? I've read two good review on the next book, so perhaps I'll try it out, if it is not too scary. Not really big on religion in books though. This one sounds worth reading, though torture scenes I can really do without, so that really would put me off. The Red Witch – this one I found via Bloddeued's blog – one of her helpers, Lis, reviewed it and I liked it well enough to try, especially that the Kindle e-book was actually discounted so dirt cheap on Amazon.Aurian, in this one religion was a background not the main topic but it added to the story.Tracy, as I mentioned the torture scenes weren't very descriptive or sadistic so I was able to swallow them somehow without more than a grimace.